BugE - More than a bike, less than a car: More painting & installing a vent fan. In the plans, there is a step that mounts one or more fans in the cowl. The default placement is a single fan placed in the middle of the cowl. On hot days, the fan might be able to provide some small relief from heat in traffic. On cooler days, this fan, combined with anti-fog and RainX should keep the winshield clear. 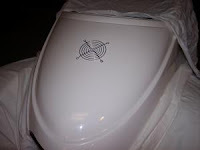 To install, note the arrow on the fan that shows direction of air flow. Then, take off the exhaust grate. Then, use the metal grate as a template to mark out holes in the cowl. Use a PENCIL, flexible measuring tape and some geometry to get it 12” from the front & placed in the middle. Then paint the grate black so it doesn't reflect in the winshield and while it's drying, do the other steps below. 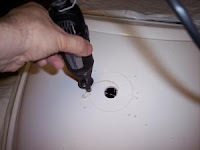 Use a DREMEL tool Drill BIT on HIGH to carve out the basic shape & drill holes for the screws. Since this is one of those one-shot moments, go slow. Just follow your pencil marks from the previous step. Try the tool in the middle first to see how the tool works. Then, work your way out. I found the drill bit was good for rough cutting in addition to drilling the fan mounting holes. The DREMEL drum sander worked well to smooth the edges. Mask with tape and newspapers. Then gently sand, then paint. In addition to the cowling, the area that could be an instrument console has been painted too. Initially, surface mounted insturments will be used. This will allow for easy adjustment as various ergonomic placements are tried. Since the fan is on the bottom of a curved surface, ¾” long, 9/64 diam. screws (and nuts) are used to secure the fan instead of the recommended sheet metal screws. Pictured here, the image shows the longer screws & nuts on the left that were added so the fan could be installed easier. Next, the outside of the battery box was painted gloss black. Since it's not very visible, gloss or matte black can be used. As for more finishing, the inside of the body needs to have a finish rather than just the reddish fiberglass color. The finish should look nice, be water resistant and not be too expensive. I'm thinking stone although rubber undercoat has been suggested as well.